Hi everyone! 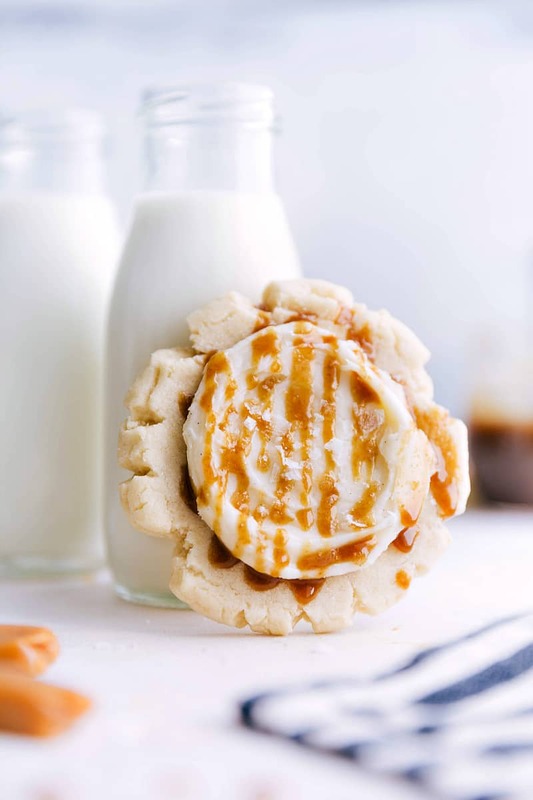 Chelsea back from Chelsea’s Messy Apron and today I’m sharing one of my family’s favorite sugar cookies! 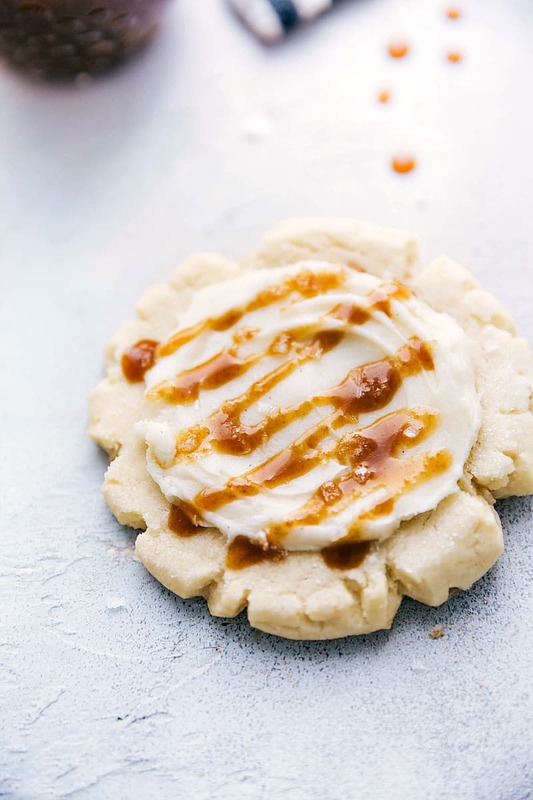 A soft and chewy sugar cookie base with the most flavorful cream cheese frosting, a caramel drizzle, and some sea salt to finish everything up! These cookies are inspired by a local cookie shop. They have the most amazing sugar cookie varieties and we make way too many stops there! This is a “copycat” of one of their most popular cookies. Honestly we think this version is even better! Correctly measure the flour: If you press a measuring cup into a bag of flour you will pack in way too much flour (which will result in cake-like cookies with the wrong texture). To properly measure your flour, spoon the flour into the measuring cup until its overfilled. Then use the back of a butter knife to level the measuring cup at the top. You’ll have a perfect flour measurement now! Use a room temperature egg: This ensures the egg disperses more evenly into the batter giving these cookies a lighter texture (the egg traps air). Soaking refrigerated eggs in a bowl of warm (not hot) water for about 10 minutes is a quick way to do this. Otherwise, pull the egg out of the refrigerator about 30 minutes before use. You also want to make sure the butter is at room temperature so it will cream with the sugars properly! Finally, it really helps to chill the dough. When you chill dough the butter solidifies which allows it to melt slower when it’s baked. This creates a thicker cookie which prevents the cookie from going flat and becoming crispy. Chilling the dough also gives the sugar time to absorb more of the liquid and become more concentrated. A more concentrated sugar is going to give you a chewier and sweeter cookie. While this recipe doesn’t require you to chill the dough, I like to pop them into the fridge for at least 10 minutes before baking! 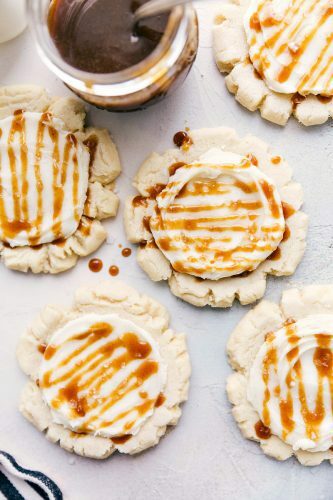 Only add caramel and sea salt to the cookies that will be eaten immediately. Enjoy!